Wow, things have been crazy around here for the past few days! Christmas preparations are getting out of hand in our house (they always do) and everyone of us are starting to lose our minds a little. There’s still so much to do before we can relax and enjoy the company of our friends and family, but in the middle of all this chaos I try to keep in mind that the hassle and craziness is not all Christmas is about. So, yesterday I decided to slow down a little and serve my family the comfort food they love more than any other dish in the world. Chicken and dumplings. I made this recipe that I got from my wonderful neighbor Lisa, just because it was a tiny bit different than our family recipe, and I wanted a little change. It turned out so awesome I may not use the old recipe anymore! We had a wonderful dinner and I haven’t seen the kids that calm and happy in days! 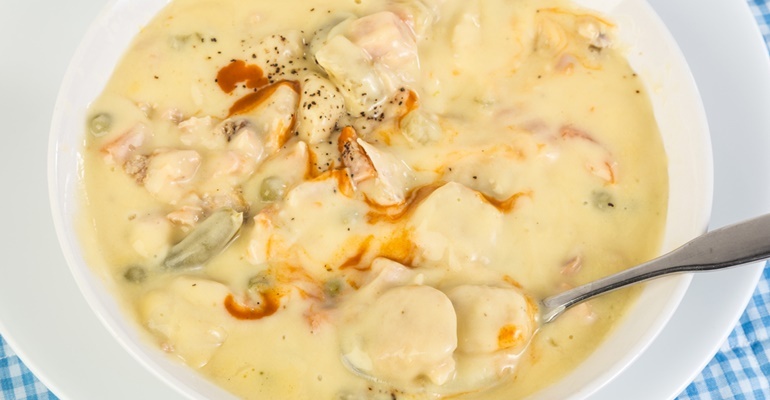 I guess there’s nothing chicken and dumplings can’t cure – and that includes holiday stress. Quick Tip: Serve with homemade dinner rolls.